Cooper is an 8 year old, Metal temperament, Quarter horse. Cooper has been raised with a holistic horse care program, with minimum vaccines and drugs. Despite a very good foundational nutritional program, including daily supplementation with a probiotic product containing blue green algae, Cooper has had a few health challenges. 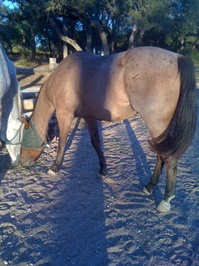 When Cooper was 3 years old he was turned out on a native grass pasture with a group of older horses. During this time Cooper did not have any supplements. Without his probiotic/algae supplement, Cooper was not able to get the nutrition he needed from the grass alone. Although the other horses did well on the grass, Cooper lost a significant amount of weight and as the weak member of the herd he was the one with the largest number of ticks. When Cooper’s owner saw him, after only a few months on pasture, she brought him home immediately and put him back on his foundational program, including his probiotics. After several months at home, Copper was still not thriving and it was determined he had contracted EPM while his immune system was compromised by the weight loss and tick infestation. Cooper’s immune system was given additional support with a product called Karbo Combo and after a few months he no longer showed any signs of EPM. Cooper gained weight and progressed nicely in his training with few health problems. Cooper did have one close call when he ate some moldy hay that had accumulated under his hay feeder. He developed severe diarrhea and ran a fever of 105 degrees. Cooper was given high doses of a Equiotic probiotic paste along with 6 packets a day of high potency probiotic/algae capsules dissolved in water and syringed to him. After 4 days of treatment, Cooper’s fever went down, his diarrhea resolved and his appetite returned to normal. Cooper seemed like a nice, well adjusted, healthy, 7 year old but he still had a few habits that frustrated his owner. Cooper was bad to spook hard and ask questions later. He seemed to have a particular phobia of squirrels, which was a huge challenge being that the little varmints were everywhere. Cooper struggled with his canter transition and got frustrated easily when he was asked to try harder at it. When frustrated, Cooper had the bad habit of doing a dolphin type leap into the air. His owner could ride this move but did not enjoy it one little bit. Cooper was not great at paying attention and had the habit of leaning into his handler instead of standing balanced. He was not pushy and had good ground manners but his lack of mental focus translated into lack of physical balance. Cooper’s lack of focus also showed up on the trail when he paid no attention to where he put his feet. This resulted in several severe stone bruises. Cooper lacked confidence and did not like to lead on the trail or work away from his horse buddies. Cooper’s owner felt like she had reached a plateau in Cooper’s training and even though she enjoyed him 90% of the time she knew he could be better. At this time in Cooper’s life, he was started on the Metal horse balancing formula. This formula was initially given only during an out of town trip or training clinic. The change in Cooper was significant. No more hard spooking, even at the dreaded squirrels. Cooper would startle slightly then calm right down. Cooper stopped clinching his lips and resisting his canter transition and learned to do it easily. Cooper was able to easily go to the lead with confidence when on a trail ride with other horses. Cooper went to a training clinic where he did not have any horses he knew and he stayed focused. Cooper no longer does airs above the ground from frustration with learning new tasks. Cooper is careful about where he puts his feet and even seeks out soft ground on his own. Last, but not least, Cooper’s balance, both mentally and physically, is good. Copper still has a few minor health challenges. He occasionally gets scratches on his pasterns. His feet can get soft when the weather is wet, and he is more likely to get worms than other horses in the same pasture. Cooper used to have a dry coat but this has been addressed by adding rice bran to his diet. Cooper was only getting the Metal balancing formula when traveling but his owner is now going to give it regularly the first 8 days of each month in addition to times of stress. It is exciting to see how the brain supporting amino acids in the Metal formula have helped Cooper learn more easily. By giving the formula each month I would expect to see the physical symptoms improve as well. The Metal formula is designed to help lubricate the digestive tract and support the immune system. Both these actions should help Cooper clear his system of worms. The immune support along with the added fat in the diet should help Cooper’s skin stay healthy and resist the scratches. Sore soles with damp weather can indicate a yeast infection in the body and the Metal formula contains papaya and glutamic acid to help support beneficial gut flora and intestinal health, thus eliminating any yeast. Cooper is a great example of a horse that was experiencing some issues despite being on a good foundational nutritional program. Cooper did not have any major health issues that required treatment and he was overall a great horse but the addition of the Metal balancing formula helped him be and feel his best. With his good foundational nutrition and the Metal balancing formula, Cooper can stay healthy and balanced. This entry was posted in Five Element Feeding, Five Element Personality Typing, Five Element Training, Newsletters and tagged holistic horse care, holistic horse health, horse, horse temperament, horses, Metal horse on May 15, 2016 by Madalyn Ward, DVM.